Fury isn’t the best war drama around, not even in the top 5, but it’s still well made and features a great cast, with Brad Pitt delivering a fine performance (one of his best in some time), that elevates the writing while Ayer’s direction keeps the pacing just right. This Robert Zemeckis helmed WWII romance-drama doesn’t exactly live up to its potential. 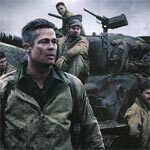 While the production and costume designs were impressive, I found the performances particularly that of Brad Pitt, to be stilted and a story that failed to connect emotionally. Fury isn’t the best war drama around, not even in the top 5, but it’s still well made and features a great cast, with Brad Pitt delivering a fine performance (one of his best in some time), that elevates the writing while Ayer’s direction keeps the pacing just right. The Blu-ray released by Sony has excellent video/audio transfers while the bonus material is quasi in-depth with 50+ minutes of deleted/extended scenes. 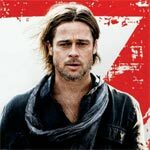 World War Z isn’t a bad movie, far from it, as it efficiently entertains from beginning to end though Brad Pitt more or less sleepwalks through his role. However, this film is the epitome of wasted opportunities as this could have been one of the best in the genre to come out but instead it’s just a safe movie with nothing discernibly memorable. The Blu-ray combo set released by Paramount provides excellent audio/video transfers but the features leave much to be desired. 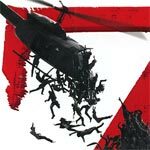 World War Z isn’t a bad movie, far from it, as it efficiently entertains from beginning to end though Brad Pitt more or less sleepwalks through his role. However, this film is the epitome of wasted opportunities as this could have been one of the best in the genre to come out but instead it’s just a safe movie with nothing discernibly memorable. The 3D Blu-ray combo set released by Paramount provides excellent audio/video transfers but the features leave much to be desired. Moneyball is a good film propelled by great performances especially from Brad Pitt and Philip Seymour Hoffman. I’m not much of a baseball fan, but the story of Billy Beane and what he did for an organization and the system certainly makes for an interesting and compelling story. The long anticipated trailer for Terence Malick’s The Tree of Life is now online. The drama/fantasy comes to theaters on May 27th, 2011.